This lentil salad looks and tastes bright, thanks to a combination of tangerine juice, sherry vinegar and colorful caramelized roasted root vegetables. It works either as a main course, served with good bread and butter, or as side dish with roasted meat or fish. For the maximum visual impact, use both golden and red beets. Vegetarians can feel free to leave out the bacon. Leftovers will keep for at least five days, though try to pack it up without the radicchio, which gets soggy in the fridge. Featured in: The Root Of The Matter. 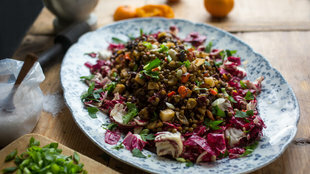 Share the post "Lentil Salad With Roasted Vegetables"
I love lentil, red bean. It reminds me of Esau, who was the first son of Isaac and sold his first birthright to his brother, Jacob. Anyway lentil salad make my mouth watered. When I saw the picture of lentil salad, my mouth began to water automatically!